Nominated for Best Picture; Best Director; Best Actor-Paul Newman; Best Supporting Actor-James Mason; Best Screenplay. Every year, I like to see all of the Oscar Best Picture nominees before the ceremony occurs. This doesn�t always - or even usually - happen, but I make the attempt. The first year I made it through all five prior to the show took place back in 1983. I barely got through them all, as I took in the fifth film on the day prior to the presentation, but I managed to do it. Some times I have no strong opinion about what I want to win. That didn�t happen in regard to the nominees for 1982, as E.T. the Extraterrestrial was my easy choice. I adored E.T. and felt seriously cheesed when it lost to the long and smug Gandhi. I would have been peeved no matter what beat E.T., but some of the other selections would have been more acceptable than Gandhi. I suppose Richard Attenborough�s epic might have bested Missing, but I�d definitely take Tootsie as the better flick. Logically, that comedy should have been my second pick for 1982�s Best Picture. However, it wasn�t. Instead, I preferred the one I saw last of the five. I didn�t watch The Verdict until the day before the Oscar ceremony, but it become my second favorite. That probably shouldn�t come as a surprise. I�ve always liked courtroom dramas, and The Verdict seemed to provide a satisfying affair. 20 years later, the movie still has some moments, but I must admit it doesn�t work quite as well for me. At the start of The Verdict, we meet Frank Galvin (Paul Newman), a down-on-his-luck alcoholic lawyer reduced to �ambulance chaser� status. When his assistant Mickey (Jack Warden) hands him an easy case as a way to get back on his feet, Galvin plans to settle and move on with his life. However, some of his youthful idealism stirs in him when he actually deals with the case. A young woman entered a coma during childbirth, and malpractice may have occurred. When Galvin actually sees the comatose woman in person, he decides to take the case to court, against the wishes of his clients, the woman�s sister and husband. This puts Galvin up against the powerful Catholic Church community in Boston, the group that runs the hospital. It also pits Galvin against Ed Concannon (James Mason), one of the city�s top attorneys. Galvin battles against the odds. With his meager resources, he attempts to cobble together his case, but almost everything works against him. At least he meets a babe named Laura (Charlotte Rampling), and she seems to help, though appearances can be deceiving. All of this leads to the climactic courtroom hearing, where Galvin will ultimately sink or swim. I won�t reveal the ending, but don�t expect anything shocking. As a personality, Galvin feels like an extension of �Fast� Eddie Felson from 1961�s The Hustler. You sense that Galvin once possessed tremendous skill and potential, but various life issues beat him into the wreck he became. 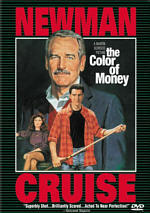 Galvin sure seems closer to the original Felson that does the version of that character seen in the sequel to The Hustler, 1986�s The Color of Money. In The Verdict, Newman displays a sense of weariness and confusion totally absent from the inappropriately cocksure Felson of Money. Really, Newman�s performance is one of the few reasons Verdict stands out at all after all this time. Just like E.T. got jobbed when it lost to Gandhi, Newman should have beaten Ben Kingsley for Best Actor that year. Newman demonstrates a remarkable lack of ego as he makes Galvin a realistic loser. He allows just enough of Galvin�s potential to emerge, but he keeps the character low-key and pained throughout the movie. Newman nicely suppresses his own natural charisma to make Galvin a fully formed person. The rest of the cast also adds depth to the movie. Mason seems particularly noteworthy. He makes Concannon rich and believable. The role easily could have turned into a stock villain, but though we root against Concannon, we never really dislike him. Even after some of the lawyer�s sleaziness comes to light, we still view him as a reasonably noble man and don�t think of him as a bad guy. In lesser hands, the part could - and probably should - have become one-dimensional, but Mason does nicely in the role. 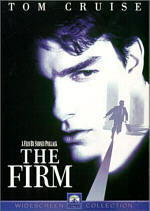 Where The Verdict falters relates to its storyline. Although the script came from no less a talent than David Mamet, the tale feels like warmed-over TV movie material. The film becomes rather melodramatic at times, and it goes too far out of its way to place obstacles in front of Frank; I thought those elements really stretched. Primary in that regard, I definitely disliked the romantic subplot between Frank and Laura. This felt pointless from moment one, and some twists that occur late in the film make it seem even more flawed. I felt these segments existed just to give the movie some stereotypical �female appeal�. The Frank/Laura relationship lacked depth and did nothing to move the story or improve it. Unlike the Eddie/Sarah affair in The Hustler, the film would have worked just as well - if not better - without the romance. Overall, I found The Verdict to offer a mixed bag. The film provided some excellent acting, and it seemed generally entertaining and compelling. However, the story seemed forced and artificial at times, and it failed to deliver much depth. Nonetheless, The Verdict has enough going for it to recommend a viewing. The Verdict appears in an aspect ratio of approximately 1.85:1 on this single-sided, dual-layered DVD; the image has been enhanced for 16X9 televisions. Much of the time, the film presented a pretty solid picture, but some flaws made it less satisfying than it could have been. The main culprit stemmed from edge enhancement. That issue appeared very frequently throughout the film. The levels of EE never appeared horrific, but the issue seemed easily noticeable most of the time. Newman frequently wore a black coat, and that garment made the haloes easy to see. Despite the EE, sharpness usually appeared quite good. Most of the movie came across as nicely detailed and accurate. Occasionally, wide shots demonstrated moderate softness, but the film mainly looked distinct and well defined. I saw no issues related to jagged edges or moir� effects. Print flaws presented moderate concerns. Some light grain showed up through the movie but didn�t seem excessive. However, I did notice occasional examples of grit, nicks and blotches, and I saw more than a few instances of speckles. The image didn�t look terribly dirty, but it definitely could have appeared cleaner. 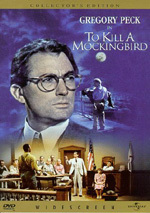 Although The Verdict featured a muted palette, the DVD replicated the film�s colors well. Despite the low-key tones, the hues appeared nicely rich and warm. I saw no concerns related to bleeding, noise, or other issues, as the colors came across as very solid. Black levels also seemed deep and dense, while shadow detail usually appeared appropriately clear without excessive opacity. Some of the interiors looked a little drab, but low-light situations generally came across as accurate. Ultimately, many parts of The Verdict appeared quite good, but between the edge enhancement and the print flaws, the image didn�t merit a grade above a �C+�. The Dolby Surround 2.0 soundtrack of The Verdict seemed serviceable but unspectacular. Most of the soundfield remained fairly heavily oriented toward the front spectrum. Music offered a modest aspect of the track, but it showed decent stereo spread. Although the score failed to deliver strong delineation of instruments, it seemed to blend together well and created a good sense of presence. Effects played a fairly modest role in The Verdict. Within the forward realm, they presented a decent sense of ambience but didn�t do much more than that. The surrounds kicked in sporadically. During the early parts of the film, the rear speakers added almost nothing, but later they occasionally provided information. The material seemed inconsistent; for example, some street scenes created general atmosphere, while others didn�t. I felt the surround usage came across as a little artificial, but it appeared acceptable for its era. Audio quality appeared fine. Dialogue sounded a little thin given its age, but speech usually was fairly natural and warm, and I noticed no problems related to edginess or intelligibility. Music seemed a little muted, but that fit the low-key score, and those parts appeared reasonably distinct and full. Effects also played a minor role in the film. Other than the processed-sounding surround elements, those aspects came across as acceptably distinct and accurate. 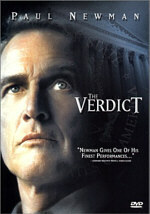 The Verdict offered a lackluster soundtrack, but it seemed good for a 20-year-old film. The DVD release of The Verdict includes a few supplements, starting with an audio commentary with director Sidney Lumet. The case indicates that Paul Newman also appears in the commentary. While technically correct, that�s really a joke. We hear nothing from Newman until almost the end of the movie. We get literally about two minutes of fairly bland and generic material from the actor and that ends his participation. For Fox to state that The Verdict includes a commentary from Newman borders on false advertising; you definitely shouldn�t buy this DVD with the hope that you�ll learn anything from the actor. Not that you�ll get much from Lumet either, though he certainly contributes a great deal more information during his running, screen-specific track. On the positive side, Lumet gives us some basic background about the project and also briefly remarks upon the novel. More significantly, he discusses the methods used via set design, color palette, and other elements to convey a certain mood and tone. Those elements seem good, but unfortunately, you must sit through many empty spaces to get to them. Lumet goes silent for much of the commentary, and that becomes very frustrating. At times, Lumet contributes some useful material, but the sparse nature of his interaction makes it a below average piece as a whole. After the commentary, we find just a few minor components. The disc provides a featurette. This eight-minute and 40-second piece mainly promotes the film. It includes some shots from the set, film clips, and interview snippets with Lumet, author Barry Reed, producers Richard Zanuck and David Brown and actors Newman, Jack Warden, and James Mason. Though the piece offers some good behind the scenes images, overall it exists to promote the film. As such, it lacks much substance. We get a small Behind the Scenes Gallery as well. This includes a whopping eight photos taken on the set, and it doesn�t do much for me. Lastly, the DVD provides trailers for a number of Newman flicks. We find ads for The Verdict, Butch Cassidy and the Sundance Kid, Hombre and The Hustler. As a whole, I felt The Verdict presents a good but not great film. The story has promise, and the actors make it work, but the execution of the plot seems flat and melodramatic much of the time. Still, it works well enough to offer an enjoyable experience. The DVD provides watchable but flawed visuals along with adequate audio and a minor roster of extras led by an iffy audio commentary. Paul Newman fans will definitely want to see The Verdict, as he and the other actors do nicely in it, but otherwise, the movie seems passable at best.